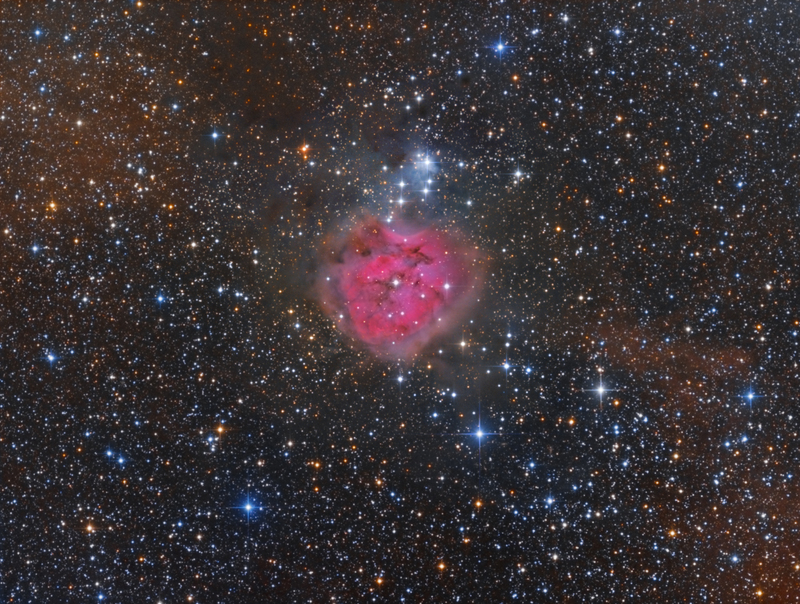 IC 5146, also known as Cocoon Nebula, is an astronomical nebula with an embedded open star cluster in the constellation Swan. The nebula is about 3,000 light years away from Earth and its physical extent is about 10 light years. The nebula is a star-forming region with ionized atomic hydrogen and has both emitting, reflecting and absorbing components. IC 5146 is located at the eastern end of the long dark cloud Barnard 168 and is part of an extended molecular cloud. Somewhat to the west lies the reflection nebula of vdB 147, which probably also belongs to the complex. The active star formation inside the cloud leads to the formation of a young open star cluster called Collinder 470 with an estimated age of a few hundred thousand years. This star cluster and especially the brightest star in its center, BD +46° 3474 (type B0 V, 10 mag), are responsible for the ionization of the nebula and thus for its luminosity. They create a "cave" in the dust and gas of the molecular cloud and thus open up a view into its interior.